PubMatic’s knowledge sharing event PubAcademy took place in Berlin last week for the first time and we were thrilled to be part of it. 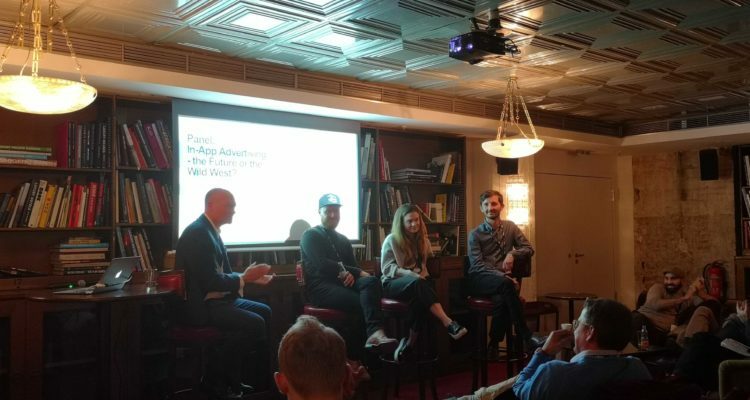 Our VP Programmatic Eka Rabe participated in a panel discussion with Jonas Wedemeyer, Technical Senior Account Manager at Adjust and Paul Czekalla, Advertising Technology Manager at eBay Advertising. The panel was moderated by Roger Williams, VP International Marketing at PubMatic. The in-app panel addressed topics such as low-quality app inventory, transparency within the in-app environment, measurement issues, and the disparity between desktop and in-app advertising. In 2018 DoubleVerify’s Fraud Lab saw an 800% increase in the number of fraud attempts within the in-app ecosystem. That number is only set to grow in 2019 as more and more apps will monetize through in-app advertising. With AppAnnie predicting this number to increase by 60%, advertisers need to be aware of where their budgets are being allocated. Paul Czekalla agreed that in the past, both advertisers and publishers believed that they could transfer their strategies from desktop to the in-app world, only to quickly realize this was not possible. Czekalla insisted that advertisers need to communicate more with their partners and Jonas Wedemeyer agreed that buyers must “sit down and do their homework in order to identify and tackle fraud”. Previous initiatives such as ad viewability metrics and ads.txt aimed to bring greater transparency to the digital advertising space, but what is being done for mobile in-app? Eka Rabe argued that there have been many initiatives put in place for desktop but it’ll take some time for in-app to be at the same level as the technology is completely different. Desktop buying tends to have a user-first approach and the ads come second. However, in mobile apps, this approach can vary. For example, many hyper-casual apps are developed purely to be monetized via advertisements and therefore can be seen as a separate playing field than desktop. Rabe agreed that in order to improve transparency, both buyers and sellers need to educate themselves and communicate with one another. App-ads.txt is also important to adopt in order to combat fraudulent advertising. Wedemeyer discussed the importance of measuring validated impressions and clicks for brand marketers, along with combining performance and brand awareness to generate deeper insights. He also insisted that there needs to be events in place to improve people’s knowledge on how to measure the success of mobile advertising and that “everyone should learn from it and grow further”. Rabe added that viewability scores can be misleading as a measurement tool, especially when brands are buying across different environments as they are measured across both web and in-app. This leads to inaccurate reports which can be frustrating for many brands. Many people make the assumption that what works for them on desktop will automatically work within the mobile app environment, which is a big mistake. This leads to brands or agencies having unrealistic expectations for mobile advertising. Eka Rabe challenged this idea and stated that there is a major difference when a mobile publisher needs to make a change to their app as opposed to changing something on the web environment as the process is not as simple. Mobile app developers are required to send an update of their app to the app stores each time they make a change within so advertisers need to be more aware of this. How Can ‘Premium’ Inventory Be Defined? Rabe insisted that ‘premium is subjective’, differing from buyer to buyer and that “if the inventory works for you, meets KPIs, and the advertiser is satisfied, then that could be defined as ‘premium’”. Others may define premium inventory “an ad impression that is in view and is surrounded by a high-quality environment”. Another example of this would be how different buyers view hyper-casual games, some as premium and some not. Wedemeyer also pointed out that interstitial ads within hyper-casual games do not bother him as a user because he is already focused, however, this may be very different in the web environment. eBay Advertising’s Paul Czekalla advises that people should “speak more with their clients rather than their technology and machines” and Eka Rabe recommends that publishers need to “get an expert if they’re considering programmatic” and preferably an in-app expert as the ecosystem is so different than web. Rabe advises advertisers to check what they’re buying and if they do not have the resources, they should reach out to their supply sources and ask them. Czekalla also admitted that even with all of the verification technologies in place, fraud traffic is inevitable, so speaking to partners on a regular basis is vital to minimize intransparency and ad fraud in the mobile app ecosystem. Thanks to PubMatic for having us at the German edition of PubAcademy, we’re looking forward to the next one!